Title: How to Never Look Fat Again: Over 1,000 Ways to Dress Thinner–Without Dieting! 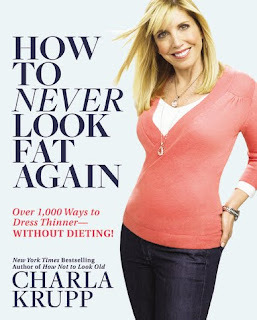 The new groundbreaking style-guide from bestseller author Charla Krupp on how to look 10 pounds lighter, 10 years younger and 10 times sexier every day, all year–in summer, winter, at the gym, even in a swimsuit! *smart, easy ways to hide arm flap, a big bust, a muffin top, back fat, Buddha belly, a big booty, wide hips, thunder thighs, and heavy calves-and that’s only half the book. *clever solutions for special fashion situations–workout gear, evening wear, and even swimsuits! So, if you’ve ever put on a piece of clothing and asked “Does this make me look fat?” Finally, here is the book that will answer your question. When I opened Charla Krupp’s How to Never Look Fat Again: Over 1,000 Ways to Dress Thinner — Without Dieting!, I admit that I was hoping for a miracle remedy so that I would look totally buff without having to work at it. Real realistic, right? That being said, the book is a fantastic tool for looking your best and avoiding common wardrobe pitfalls that make you look not quite your best. Let me explain the beauty of this book. Nine of its 16 chapters are devoted to specific body issues; arm flap, a big bust, wide hips and thighs, and heavy calves, to name a few. Let’s discuss heavy calves for a moment. Krupp advises not wearing shorts. You heard right. She also suggests doing away with the gladiator sandals, micro-mini skirts, and any clothing that hits mid-calf. Ya know what I mean capris and cargos, Uggs and Mukluks. It’s true. Now, I’ve always had big calves, so I can sympathize. I am not a shorts person, for that reason. I’m already opposed to capris and cargos as well, because they’re simply not flattering to me. Krupp also lists the shoes you should avoid at all costs: ankle straps, flats, gladiators (she must feel strongly about these to mention them twice), espadrilles, and â€œboots that are so tight that they give your calves muffin top. Let’s move on to Krupp’s 10 Things that Make You Look Fat When You Have Wide Hips & Thighs. Number 1: Skinny jeans tucked into boots. Among the list of this Top Ten: Whiskers across the crotch on pants and skirts and tight boot-leg jeans. Oh boy. If you have Muffin Top, these things will make you look fat: Short tops paired with low-rise pants, baggy clothes (who isn’t guilty of this? ), wearing boxy jackets, dresses with a waistband and belt that sit at your real waist, and breaking up the body at the waist with color. I chuckled when I came across the Muffin-Top Friendly Guide which lists acceptable tops, including A-shape tops, empire tops, and Dolman tops (cut deep at the armhole). Do you get the idea? Sure, you’ll come across things that seem like no-brainers, but there is a plethora of tips in this book that will help you look good. How to Never Look Fat Again is also full of pictures, including before & after photos, and the improvements are stunning. So, the verdict is following the tips in this book can make you look buff. Without exercising or dieting! How can you NOT read this book?